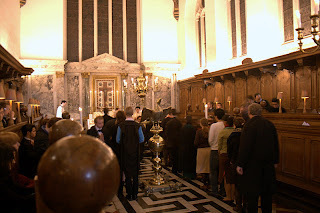 For the first time for many years, the Oxford University Newman Society held its Termly Mass in the usus antiquior. 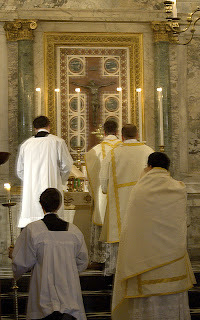 For the first time ever, I think, since 1970 this was a Solemn High Mass. It took place in Brasenose College Chapel, by kind permission of the College authorities. Fr Dominic Jacob of the Oxford Oratory was celebrant, Fr Anton Webb (ditto) deacon, and Br Lawrence Lew OP was subdeacon. Mr Richard Pickett was MC, with a team of Newman Society servers. The propers were sung to a very high standard by the Oxford Gregorian Chant Society; Mr Andrew Knowles organised a superb polyphonic choir for the ordinaries and some motets. For more on the music see here.Mass was extremely well organised and despite torrential rain was attended by about 90 people. It was followed by a the Newman Society's splendid termly black tie dinner, which was addressed by Mr Julian Chadwick, Chairman of the Latin Mass Society, who had attended the Mass.